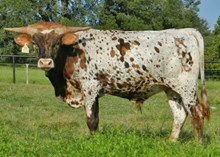 This young cow is loaded with Top Caliber and JP Rio Grande genetics. She was 70" TTT @ 36 months and will challenge 90" TTT at maturity. She has had two outstanding calves and is a great mother. A real winner. Sub Lot # 11, Red McCombs Heifer Sale, 6 pm, Friday May 1, 2015. Tip to Tip 69.2500 09/08/2017 3rd birthday, outstanding!